I saw these on Pinterest last year, pumpkin time had passed for me so I kept the idea stored and now that “pumpkin time” has returned these were, of course, the first thing I wanted to make! Please do make these! They are good, seriously good! The recipe was by the Blue eyed bakers and they say you will need “comfy pants”, indeed this is true! These cute little donuts are sweet and spicy with a hint of pumpkin pie, just perfect for kicking off autumn and pumpkin time! The recipe was in cups so for all those here in the UK I made the recipe and weighed all the ingredients in grams so you too can share in the delight that is the mini baked donut! These donuts, as delicious and cute as they are do not store well, in fact not at all. You have a couple of hours at the most to enjoy these little treats, after that the sugar begins to melt! You can make the donuts ahead of time but don’t coat with the sugar until just before serving. I pretty much followed the Blue Eyed Bakers recipe so have linked to that and just included the measurements in grams below. The only change I made was to leave out the cloves (husband is a hater) and I coated half of my donuts in plain sugar as cinnamon is not as popular here! I love cinnamon everything (does anyone remember those cinnamon toothpicks years ago?) but I am aware that as strange as it may be to me not everyone likes cinnamon as I do and actually the donuts themselves are quite cinnamon-y so the plain sugar-coating was equally good, these mini donuts really are my new favourite thing! 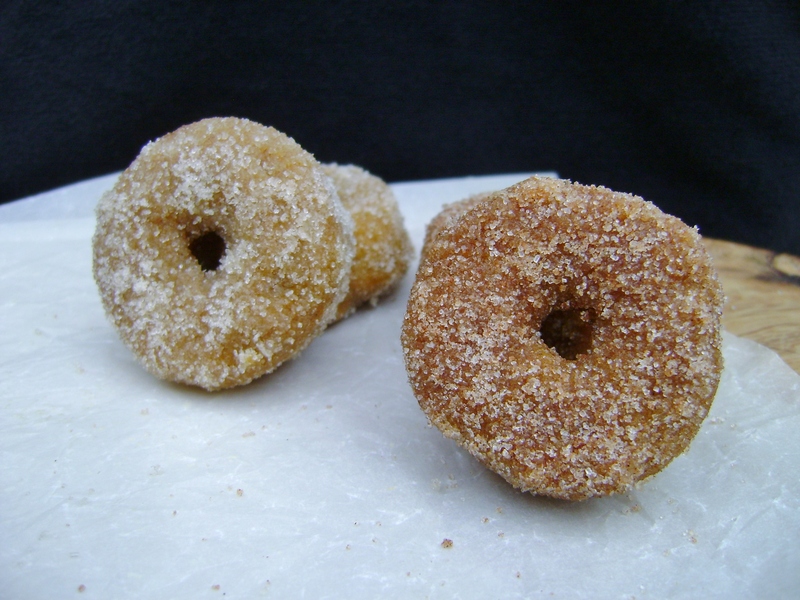 For a mix of cinnamon sugared and plain sugared donuts mix 70 grams of the sugar with the cinnamon to coat one half of the donuts. Use the remaining sugar to coat the other half of the donuts. This entry was posted on September 27, 2013, 16:55 and is filed under Baking, dessert. You can follow any responses to this entry through RSS 2.0. You can leave a response, or trackback from your own site. Dangerous! I could gobble up the entire batch! Thanks they are cute arent they? Let me know how they go GF! Dreamy indeed! Ive seen those little donut machines, that would be perfect! Wow these look good. 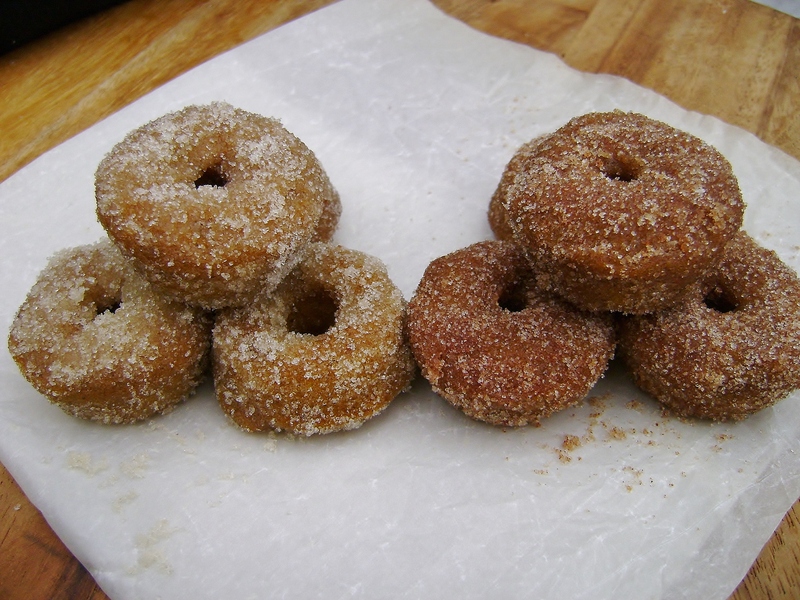 I now really want a mini donut pan myself, as the reason I never make donuts is the hassle to cook them in a fryer. Now I have no excuse. Baking them is so much easier. They sound heavenly and I will leave out the cloves too! Thanks Laura, I try not to buy novelty pans like that as they often turn out to be nothing more than cupboard fillers but I’m certain that wont be the case with my donut pan! Baked donuts are the way to go! WOOT! 😉 I know I shouldn’t but I do. 😉 Yummm…. Ooh these look like a good way to use some of our mass of leftover pumpkin! A perfect way to use up pumpkin! Thanks for stopping by!